As an addict of Candy Crush, I decided to make a costume out of the popular game of matching candy pieces. I shopped around to find lots of pink items - a corset top, tutu, stocking. Then game the game board. Finding candy pieces that were identical to the candy crush pieces that were about the same size was not easy. I ended up at local grocery stores in the bulk candy section that sold a lot of "old fashioned" candy and amazon! I added the Swedish fish as a cute touch to some of the "jelly" levels. I made the board out of an old shoe box lid and construction paper. Glued the pieces on the board and a few on my corset top as well! I found some Candy Crush earrings on Etsy. 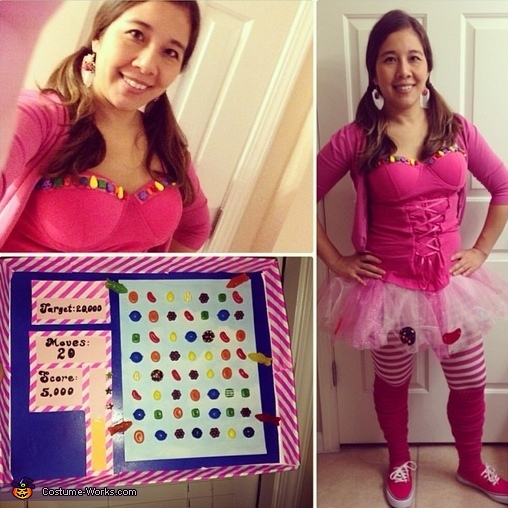 That is how to dress as Candy Crush for Halloween!